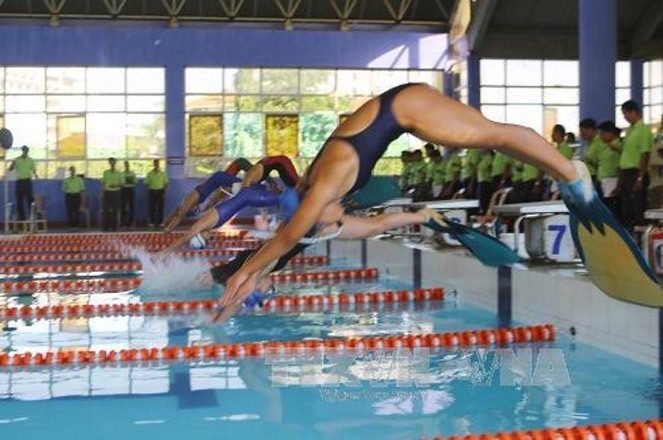 HÀ NỘI — HCM City triumphed at the National Age Groups’ Finswimming Championships which wrapped up in Đồng Hới City in the central province of Quảng Bình on Wednesday. The team bagged 21 golds, nine silvers and eight bronzes. Đà Nẵng came second with 12 golds, 14 silvers and eight bronzes. National Defence Sports Centre 5 was third with seven golds, nine silvers and seven bronzes. The three-day event attracted the participation of 16 teams nationwide, competing for 54 sets of medals. On the last day of the competition, Nguyễn Tiến Đạt of HCM City pocketed the gold medal in the U15 boys’ 50m LC with a time of 15.55secs. Nguyễn Duy Anh of Đà Nẵng and Nguyễn Dương Huy of HCM City took the silver and bronze medals. In the U16-17 boys’ 50m LC, Nguyễn Tuấn Phúc of HCM City won the gold medal with a time of 15.56secs. Trần Trung Thành of HCM City and Phạm Văn Quang of Hà Nội were the runners-up. Once this event ends, the National Age Groups’ Swimming Championships will begin today with the participation of 25 teams. Young swimmers will vie to gain 105 sets of medals in three age groups --16-18, 14-15 and under-13.